Is it the bangood Signal gen kit ? http://www.banggood.com/DDS-Function-Signal-Generator-Module-DIY-Kit-Pulse-Sine-Wave-p-958215.html I have one on it way . I must have about ten wee electronics kits to build ,I bought about 5 PIC projects kits from Rapid Electronics . Yes, Rob, that's the one. I've also been considering building one of my own around a pic or arduino. There are a lot of plans online. Bummer your scopes going South on you , I have a cracking 100MHz scope Dave BC kindly donated to me , I mainly got the kits for a bit practice and to help understand whats going on , not arsed if I blow the cheap kit one with my prodding and poking about ,I would just build another. I spent hours looking at all the goodies available from Banggood. Luckily I got both my scopes running again. I found an identical capacitor on eBay for just over £1 delivered. A couple of 20mm 125mA slow blow fuses cost more. I'm OK for a sine/square/sin wave generator 0.1Hz to 2MHz but yours takes a lot less space and tells you what it's doing. Are you going to tell us what other kits you bought or do we have to wait? Do you have any links handy , no worries if you dont I could have a look over the holidays . I have PICAXE , GENIE and Arduino ,,,,,,,,,,,,,,,,to mess with . I must say for the money the Bangood kits I have receved have all worked , the PCB's are cracking quality (well to my inexperienced eyes they are ) , no parts missing , probably not the best components but for the few quid they cost I am happy . I've ordered a little LCD Touch Screen for my Raspberry PI for just over £8. I am pleased yoy have your scopes up and running , what are you making with a Raspberry pie and touch screen ? OK! , A real mixed bag , the kits above scope ,component tester ,power supply , signal generator . Then there is the programmable stuff , PICAXE ,GENIE and Arduino projects and development boards all very basic . some 555 projects , times that sort of stuff , a DC PWM motor controller . I am pleased you have your scopes up and running , what are you making with a Raspberry pie and touch screen ? I'm using the Raspberry Pi for our Hydro Scheme. We currently have two grease pumps which supply biodegradeable grease to the bottom bearings of the Archimedes screws. Each top bearing has two Simalube grease cartdridges. These have a dry cell which generates hydrogen to pressurise the cartridge thus forcing the grease out into the bearing. These cartridges are expensive and cost around £250/year all to dispense around £5 worth of grease. I've ordered an SSVD which is a valve which will send a certain proportion of the grease pump output to each of the 6 grease points. I need 10gm of grease/day to each of the two bottom (submerged) bearings and 1gm/day to each of the ports on the top bearings. The SSVD has an indicator pin which moves in and out as grease moves through it. I'm detecting this movement with a proximity sensor. This connects to the Pi through an opto-isolator to keep 24v well away from the inputs of the Pi. The grease pump will be set to run for approx 20 seconds every 40 minutes. When the Pi sees the pin move it will start timing. If it doesn't see the pin again within say 41 minutes it will sound an alarm in our power house and, more importantly as the power house is normally unmanned, send an email telling a few of us that the grease pump may be empty or may be faulty. This was my first venture into the world of Python programming. Flushed with the success of this I set about trying to measure screw speed. The system records screw speed but only once every 15 minutes. We think we've had some violent overspeeds but these have been missed by the log file. 6 tons of not well balanced screw spinning fast could have disastrous consequences. The screws normally run very slowly (max of about 30 rpm, min about 6 rpm) so I thought the Pi would have no problems looking at a proximity sensor which is set to detect big socket screw heads on a coupling between the screw and the gearbox. There are 12 bolts on the coupling so the max frequency I'd be looking at would be 6Hz. Not rocket speeds. I decide that the best way to get the speed would be just to get the time between the sensor seeing two bolt heads. I soon found that, even at the pedestrian speeds I was looking at, the Pi is useless at real time stuff when using a multitasking operating system unless you use interrupts. This is where it got scary for me. For GPIO control I was using pigpio which had a function something like wait_for_edge.fallingedge with timeout which I thought would work nicely and the timeout function would cope with a screw being stopped. The results I got were fairly promising but every now and then a spurious result. This is when I got the scopes out to look at the output from my pulse generator (which I was using to simulate the output I'd get from a running screw) as I thought it may be inconsistent - it wasn't. I contacted the author of pigpio and emailed him my code. He very quickly replied telling me that the times returned by his wait_for_edge function could be up to 0.1sec out! He would change his documentation to make this clear. He suggested using callbacks (from interrupts) and within a couple of hours had emailed me some basic working code. I then set about filtering the results to only show > 1% changes in speed and writing the results to a log file with a timestamp. Without the filter the files would grow to enormous proportions. I'm just getting the code right for starting a new log file at 00:00:00 every day and emailing myself the previous day's file. The touch screen is so I can have a live screw speed display in the power house. Then I might think about drawing speed/time graphs. Have a Very Good Christmas and a Happy & Healthy 2016. You lost me at " Hi Rob " only joking mate . Arh I keep forgetting your Hydro project ,great stuff . Two real world applications for a small microprocessor very interesting , all way above my pay grade at the moment , I am at the make LED blink stage lol ,That will be one hell of a saving on the grease bill ,money that could be better spent elsewhere on the project . I was hoping to build/come up with something similar . I want to log when and for how long a battery has been on charge . PS you full recovered from your cycling mishap ? 3 weeks ago the only python I knew of was something that squashed and ate you in a nightmare! I too was pleased when I got an LED to flash for the first time. I wrote tons of stuff in BBC Basic but a long time ago. I don't think that knowing Basic helps at all with Python. If you look for online documentation you have to be very careful that your looking at the documentation for the version of Python you're using as things can change dramatically between versions. Timing things looks fairly simple when you see that datetime.now() returns something like 24/12/2015 15:06:44.995179 which is accurate to the microsecond. However as I found out actually getting microsecond timing of events needs interrupts. If you only need a time to the odd second or so it should be straightforward. My latest cycling mishap did for my shoulder. It's very slowly getting better. I just have to remember not to try to lift anything heavy above shoulder height. I've just been planing 0.5mm off the top of the front door. We've just had the hall, landing and two lots of stairs plastered - everything's damp and the door had swollen. Hopefully we should be dry when the family come round for tea tomorrow. 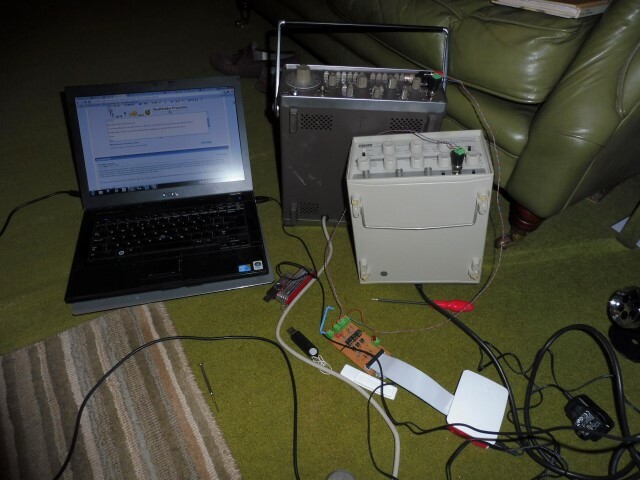 I've got the Pi, Function Generator, Pulse Generator on the floor in the living room with wires trailing between. I'd better put them away before tomorrow or else I'll get some grief! I started with a mouse and monitor connected as well but now I've installed VNC and can drive it all from my laptop. Hi Rob, loads of shields and projects about - like you said googling brings up a lot. I'm guessing that a simple square wave will be made with a simple pin going high and low - either on an interrupt or delayed loop. Dead simple, pin1 go high, delay, pin1 go low, delay and loop. I can see from the online projects that there is more to getting nicer wave forms. I've got s few play stepper motor drivers so I'll be giving them a test to get my scope going. Rob, have you looked at the Mikroelectronica stuff? - their easyPic 6 board got me flying with some proper pic coding in C. Well worth a look at if you have some spare cash and admittedly it isn't the cheapest. Phil, just wanted to say hello and merry Christmas. I was in touch with you weekly for many months then dropped off the face of the Earth when I moved house a year ago. Hope all is well. Hello and a Merry Christmas to you. You'd see a difference in our hall now now it's plastered. I've earned some Brownie points by getting this done. I might replace some of my equipment with stuff from BangGood - it would take up a lot less space. It's all got to disappear later! Eeek... watch out for static electricity with all that carpet under foot! With the humidity level in the house since the plastering static isn't an issue. I was wondering, can I run this from a 9volt battery or does it need a proper power supply? I also ordered the component tester and comes with a battery connector so thats ok, mind you, I haven't received that yet. cheers and have a good holiday. There are a few videos on you tube on SMD soldering ,it was pot luck what I got . Only draws 109 milli amps , you could omit the white connector to the right of the power socket and solder a 9v battery snap connector to there . or I could send you the plug that fits the white connector when they arrive ,I ordered 10 ,you're more than welcome to one . Thanks for the Info Rob. I've been watching Dave Jones on the EEV blog https://www.youtube.com/user/EEVblog/videos and he has a tutorial on smd soldering. Thamks for the offer of a plug, it looks like a standard computer type connector, I'll look through my collection of junk trash useful bits and get back to you. I reckon the bango gear is no where near as good as your pro kit . 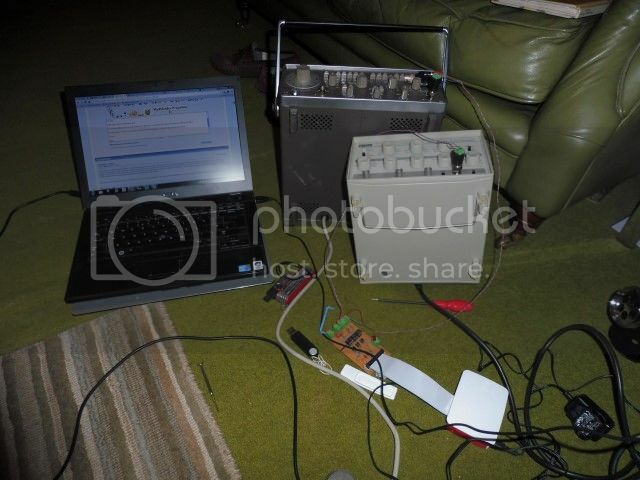 Looks like built your own board too ,is that a signal generator your using for testing ? Have a look at this video ,it the kit you will receive .